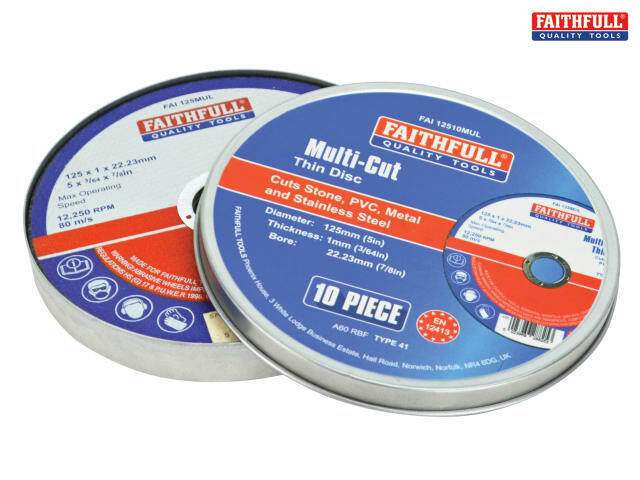 The Faithfull Multi-Cut Cutting Discs will cut a wide range of materials used in the construction and fabrication industries. At only 1mm thick they are able to provide a fast cutting action with less waste and dust. Multi-Cut discs solve the problem of cutting several different materials at once and are ideal for cutting modern day composite materials used throughout industry. Will cut sheet metal, stainless steel (inox), pipes and profiles, brick, stone, ceramic tiles and other building materials along with plastics/ PVC. These versatile discs are available in the three most popular sizes and are supplied in a sturdy metal storage tin of ten for safe keeping.